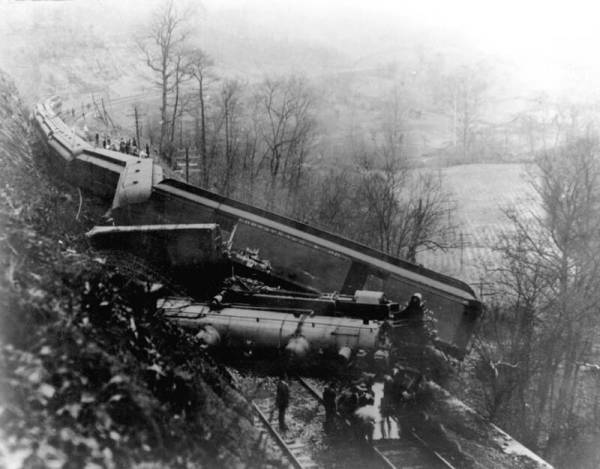 Tuesday, March 12, 1907 was a very sad day for the entire populace of Hinton due to two very serious accidents on the Chesapeake and Ohio Railway that claimed the lives of three highly respected citizens. A state of gloom was prevalent the entire month of March that year. It rained almost continuously with violent thunder storms accompanied by severe lightning illuminating the dark nights. A number of slides had fallen on the track of the C. & O. but no serious accidents had occurred. Citizens of Hinton were saddened by the news they heard when they arose from their sleep Tuesday morning March 12, 1907. The likeable neighbor, husband and father of seven small children, Mr. John B. Lutz had been killed in a rear end collision at Sewell, W. VA., in the New River Gorge at 3:20 a.m., that morning. His brakeman, Hugh Ratliff, was in Hinton Hospital suffering from injuries received in the wreck. A few minutes after nine o'clock, as people discussed the Sewell wreck, word was received that "F.F.V." fast passenger train No. 3 due into Hinton at 9:20 a.m., had struck a shale slide near the trestle and embankment at Powley's Creek. No. 3 Engine 154, Engineer John W. Flannagan Fireman Michael Quinn, on time and running at maximum speed when they hit the slide which was small but sufficient to derail the engine. After being derailed the engine ran its length and the length of four cars. The engine then broke loose from the tender and turned over resting on its side blocking both tracks. The cab was wedged against the hill and Mr. Flannagan was caught under the Johnson Bar (reverse lever), pinning him there and he was badly scalded by steam and hot water from broken pipes. Fireman Quinn was found beside the upended tender also very badly scalded. The baggage car was thrown across the tracks projecting halfway over the perpendicular embankment. The combination car was heavily damaged and the track was twisted and destroyed for over one hundred feet. On arrival of a relief train, Mr. Flannagan and Mr. Quinn were still alive and were taken aboard Superintendent Grice's private car where medical attention was administered to them. The relief train arrived back in Hinton about eleven o'clock. Mr. Flannagan was removed to his home where he died at 11:30 a.m. Mr. Quinn was taken to Hinton Hospital where he died at 1:30 p.m. Passenger train No. 14 went to Powley's Creek on time where No. 3's passengers were picked up and the train returned as train No. 13. Mr. Flanagan was born Oct. 23, 1848, and was 59 years of age. He was one of the oldest engineers on the system and perhaps the best known. He was hired as a fireman in 1871 and came to Hinton with the railroad. After firing a locomotive for five years he was promoted to engineer and ran the locomotive of freight trains for six years. The past twenty-five years he was in passenger service and had been running No. 2 to Clifton Forge, VA., returning to Hinton on No. 3 for the past fifteen years. Michael Quinn was twenty-five years of age and had been a locomotive fireman for four years. He was a son of the old boatmen on New River, Thomas Quinn, of Farley, W. VA., in Pipestem District. Mr. Flannagan was a member of the Brotherhood of Locomotive Engineers, the Elks Lodge and the Masonic Lodge of which they all had a part in his funeral service at 2:00 p.m., Thursday, March 14th., the B. of L. E. at the home, the Elks at the Methodist Church and the Masonic Order at the grave. He was laid to rest at Hill Top Cemetery near Hinton. Mike Quinn was a member of the Brotherhood of Locomotive Firemen and Engineers. His body was taken to Farley for a funeral service where he was laid to rest in the family burying ground at Farley. So sad was the day of the funerals of Mr. Flannagan, Mr. Quinn and Mr. Lutz, Thursday, March 14, 1907, the entire businesses in Hinton closed and not a wheel turned in Hinton for the C. & O. between 12:00 noon and 4:00 p.m.